Welcome to our place - YHA Nelson by Accents! Our hostel is family owned, award winning and right in the centre of Nelson. A fresh travellers retreat in the heart of the city where you can relax in our sunny garden after a busy day exploring the town. Our awesome location means you can walk to everything....the best local cafes, craft beer bars, shops, 3 supermarkets and more. You can party in town with the people who do it best then relax in the comfort and security of the hostel. Nelson's famous Saturday market is right next door. When you arrive the intercity bus station is only a minute walk away and the airport super shuttle drops off and picks up from our front door. (as do Stray, Kiwi Experience, Abel Tasman Coach lines, kayak companies... - making life easy for you! 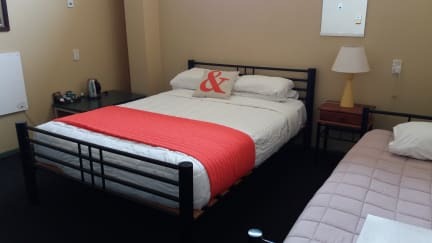 Our property has great beds, free WiFi, a sauna & awesome mountain bikes but....we can also help you find the best coffee, great walks, awesome kayak trips, refreshing swimming holes, stunning views and lots of free things to do in Nelson. If you love food, our large well equipped kitchens provide plenty of space to cook your favourite meal or bake a cake and the modern colourful dining area is a great place to socialise. We even provide a selection of herbs and spices along with fresh bread delivered daily for our guest to enjoy. Our quiet lounge room has a reading area/book exchange, a music space and an enclosed TV Room with hundreds of movies, if you just feel like unwinding. We have new Mountain and Hybrid bikes (2019 Models) available to hire if you want to explore Nelson's biking trails. We also offer the following services and facilities: a lovely sauna, secure bike storage inside the hostel if you have your own bike with you, guitar and piano available to play, board games, football and air hockey games to challenge your friends, heated rooms and extra blankets, pillows & hot water bottles available with no extra charge, luggage storage for all our guests, late check ins available, CCTV security monitoring, free in room lockers, laundry facilities including a Sink and an ironing board, towel hire, printing facilities for your boarding passes, tickets etc. and hundreds of free movies to watch. There is no cancellation charge for cancellations received before 6pm the day before arrival. For cancellations made after 6pm the day before arrival, a cancellation charge of first night only will apply. If you do not arrive on the reserved date and fail to advise the Hostel the non-arrival charge will be the first night’s accommodation.